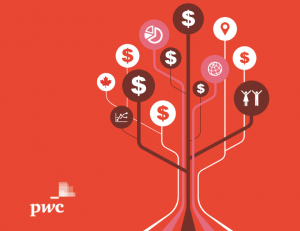 PwC recently released its latest MoneyTree report for Q2 2018. Spotlighting funding trends from the country’s five major tech cities–Toronto, Vancouver, Montreal, Calgary, and Quebec City–the document revealed a large amount of capital being invested at the seed stage. Nowhere was that truer than Vancouver. 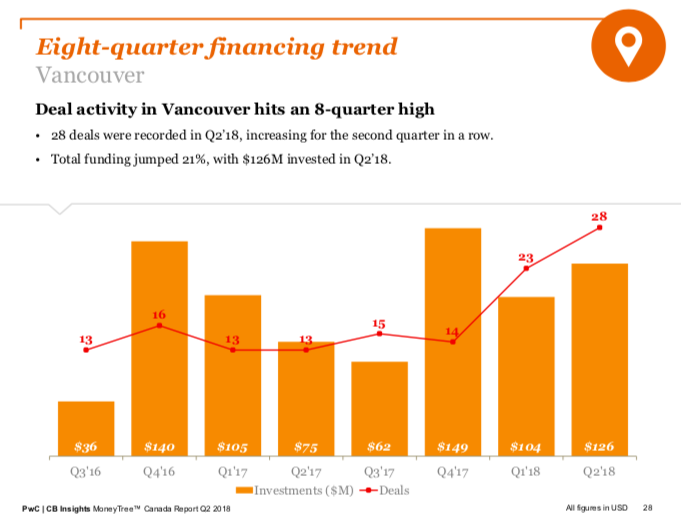 Unlike early, expansion, and later-stage funding, which declined at a national level this past quarter, all phases of deal volume and dollars increased in Vancouver compared to Q2 2017. The seed stage was responsible for the biggest jump, with the number of investments rising from five deals to nine. According to Cameron Burke, a Vancouver-based managing director within the technology industry at PwC Canada, the uptick stemmed from the growing maturity of the city’s tech sector. The emphasis on seed funding on the West Coast was reflected in the amounts received last quarter. 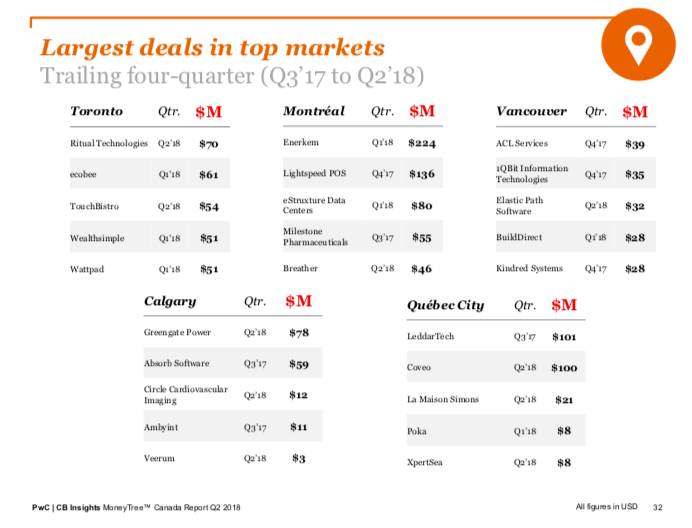 PwC’s data reveals that Toronto secured only five more deals than Vancouver in Q2 2018 – 33 to Vancouver’s 28 – but its total funding was almost double. Toronto companies received $381 million ($290 million USD) of capital compared to Vancouver’s $166 million ($126 million USD), with the average Toronto deal clocking up $16.7 million ($12.8 million USD) to Vancouver’s $7.8 million ($6 million USD). Vancouver’s tech ecosystem, however, is still anchored by its early-stage companies. The 2017 Global Startup Ecosystem Report named the city as the top startup ecosystem in Canada, and the 15th best worldwide. Across the lower mainland, there are close to 1,100 startups, many with very competitive valuations. A few of those startups that raised funding this quarter include Dooly.AI, which was founded by a 10-year Vision Critical veteran that raised $2 million, and AvenueHQ, which raised $4.5 million to seek US expansion. One vertical that excelled in last quarter’s funding rounds was “internet software and services,” a category which includes e-commerce, web-hosting platforms, browser software, online advertising, and email. Ten of the 28 companies to secure investment in Q2 2018 create SaaS products, and Vancouver’s third highest deal was clinched by Elastic Path – an e-commerce enablement platform – which raised $43 million ($32 million USD). True to form, however, the majority of Vancouver deals went to a range of different industries. That multiplicity was mirrored in the nationality of investors. Of those putting money into Vancouver’s ecosystem, 33 percent were Canadian, 29 percent were American, and the remaining 38 percent came from other international destinations, including Australia, Singapore, Germany, and China. While those numbers remain consistent across the past eight quarters, Burke believes the composition might change in the future. BetaKit is a PwC MoneyTree Canada media partner. Photo via Unsplash. Kate Wilson is the technology staff writer for the Georgia Straight — Western Canada’s largest news and entertainment weekly. A Cambridge University graduate, her articles have been featured internationally in publications including The Independent newspaper, BC Business, and VR Scout. CanCon Podcast Episode 2: Is Winter Coming for Canadian tech?